Adam Strange, The Justice Society, Firestorm - DC's character library hosts a whole arsenal of characters and wickedly cool concepts, that it appeared may never get the animated DVD treatment, due to the fact they don't have 'Super' 'Bat' or 'Wonder' in their veins, let alone a shiny green lantern to fly around with. Thankfully, that's all about to change. Announced today on Wired.com, and spear-headed by the animation genius that is Bruce Timm, DC Comics and Warner Bros. will add new animated shorts to their marquee character DVD releases, in a move that nods to both the popularity of Batman: Brave and the Bold, and the history of 'back-up' strips in the pages of DC comics. 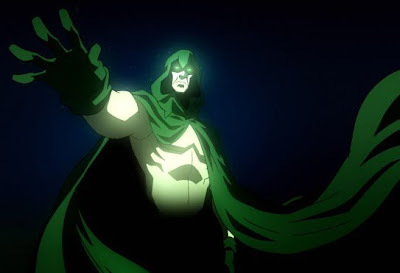 With the animated rarity of the back-up features threatening to over-flavour the 'main event' for deprived comic fans, the first slice served will be The Spectre (voiced by Gary Cole), as part of the Justice League: Crisis on Two Earths feature package, due out February 23rd. Stepping out of the shadows of the 'big guns', God's 'Spirit of Vengeance' will be written by 30 Days of Night’s Steve Niles, and focus on the 1940's era of the character - where the spirit inhabited the body of hard-boiled cop Jim Corrigan. 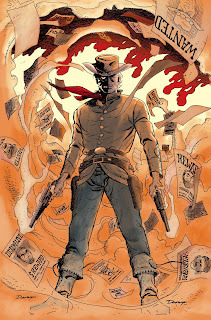 While disfigured cowboy/antihero, Jonah Hex is the only other short to be announced so far, these spots represent a great opportunity for some of DC's best to gain a bit of mass recognition, and even stand as 'tryouts' for their own 'standalone DVD.